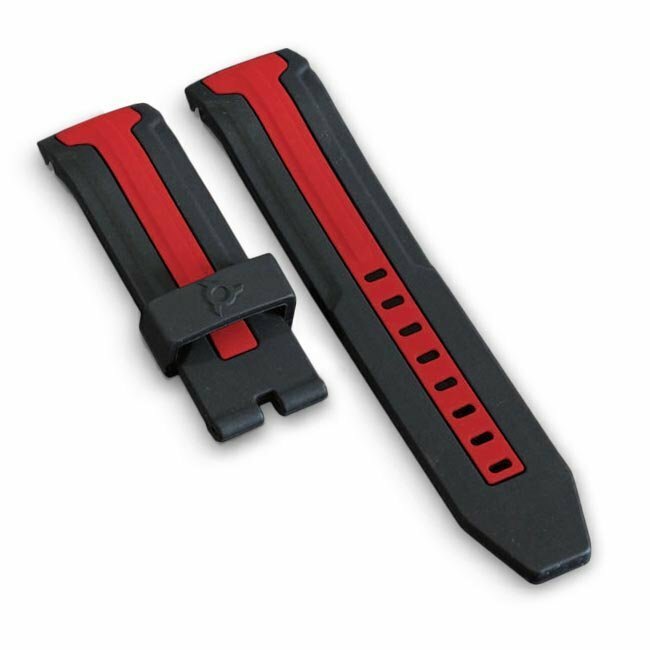 Double injection silicone black and red watch bracelet for Wryst Ultimate ES60. The Swiss sports watch model ES60 looks sporty with either the all black bracelet or this bicolor dust proof band in black with a red central line. The name of this collection Ultimate is inspired by extreme sports hard-necks and adrenaline freaks for a bold and masculine look. The black DLC square buckle is not included and can be bought separately. Fit your quality bold Swiss sports watch Wryst ES60 with this smooth, strong and comfortable black and red watch bracelet. Bold, classy and sophisticated, the 45mm sturdy Wryst Ultimate ES60 benefit of the strongest materials. Black DLC crown, casing and buckles is the best protection for a long lasting stainless steel sports watch. All references from this collection also provide with 200 meters water resistance and a bright contrasted dial protected by sapphire crystal. Since 2012 Wryst thrive to produce ultra resistant timepieces designed to endure rough environments.